There have been many studies on what great businesses do differently. Each have identified a number of common benchmarks. Here I review key Best Practice Benchmarks as related to small businesses. These will include Business, Financial, Marketing and Operational best practices. Bookmark this page and check back often for updates. The first practice in common with all great businesses is Strategic Planning. They all have a five year plan. Great businesses all produce a five year strategic plan. This is a fully integrated plan that connects financial forecasts with business, marketing and operating strategy, It presents the opportunities for the business and lays out step-by-step the actions that will be taken, the cost of those actions and their expected returns. The plan also identifies risks since all strategies have them. The market may not respond as expected. The economy may sour. Operational difficulties may be greater than anticipated. The plan should quantify each risk and look for mitigation strategies to manage them. The first step is to picture where the business will be in 5 years. Where it will be operating, what its products and services will be and how they will be delivered, to whom they will be delivered, the turnover and profitability. Having established the business goals, the strategy becomes the “How”. What will be the marketing plan? What innovation, business development and skills will be necessary? How will all this be financed? When businesses have such a plan, it makes decision making much simpler, as it‘s easy to be distracted by ‘opportunities’ which superficially look attractive but divert the business from the long term objectives. Five years is a long time, and a good plan like a map will show you your progress to your ultimate destination. Without a plan or map it is easy to get lost. While the plan should be reviewed each year, if it is truly strategic, it changes only marginally unless some major shift has occurred. Frequent changes means that the business is shooting at a moving target. Great businesses incorporate within their Five Year Plans all the other benchmarks of best practice as their targets. The first article on Small Business Best Practice Benchmarks was about how all great businesses have a five year strategic plan. While this is a necessary part of the planning process, it is not sufficient. There also needs to be a detailed operational plan. All these plans support the strategic objectives of the current year and are brought together into a fully costed budget. From this budget, Sales, Gross Profit and Expenditure targets can be set and a profit forecast derived month by month. Key Performance Indicators for every part of the business – daily, weekly, monthly, quarterly and annual, are produced by great businesses, from these plans. He was of course referring to a battle situation where the enemy has its own plan which is, naturally, to prevent your plan from succeeding. This means that plans must be flexible and responsive to changed circumstance. The planning process enables you to consider the possible outcomes but not to identify which of the possible outcomes is likely to be the reality. A good planing process will also have identified contingencies. To achieve success the plan must continually be compared with actual outcomes. Best practice is to have monthly business performance reviews against the plan which will allow the adjustments to the next month’s plan to recover lost ground or take advantage of new opportunities. Weekly reviews should also be undertaken of those key performance indicators that are relevant to that time frame. In some businesses where operational costs are high, even daily reviews of the relevant activities are necessary. Without performance reviews, there is no connection between the plan and the outcome. 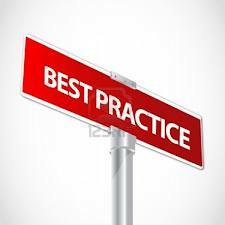 Previous small business best practice benchmarks articles were focused on planning and management. Next we turn to financial performance, specifically Earnings Before Interest and Tax (EBIT). This an important measure for any business, but first we need to understand what it is measuring. Good benchmarks try to exclude factors that are not relevant to what is being measured so that comparisons can be made on an apples to apples basis. By taking out the Interest component, comparisons between different businesses irrespective of their financing arrangements are possible, thus focusing on their underlying profitability. Tax is also taken out of this measure to keep the focus on underlying operational performance which may be distorted by different ownership structures and deductions claimed. EBIT, however, does include Depreciation, so a profit return on Capital Assets is a part of this measure. This is important because investments might have been made to improve productivity or assets may have been purchased rather than leased. Both these actions have the effect of reducing expenses, but by including depreciation, the effect of these decisions is relatively neutral when using this measure. The EBIT benchmark is usually made as a ratio to Sales in order to standardise the result over a range of different business sizes. The Best Practice Small Business Benchmark for EBIT is > 12% of Sales. The problem with a lower target is that small changes in Sales can easily turn a modest profit into a loss. While it is possible to run businesses with single digit EBIT ratios, such businesses are usually low margin, high volume businesses with very strong financial controls, not typically seen in the small business sector. Return on Assets (ROA) is the ratio of Earnings Before Interest and Tax (EBIT) and Total Assets. This gives an indication on the return on the value of the business’ assets. This excludes any financing effect which is why Interest is added back to earnings. This ratio provides an indication of the effectiveness of the utilisation of assets in the business. A low figure would indicate that the business is operating under capacity or poor efficiency in asset utilisation. Small Business Best practice for this ratio is >25%. The Interest Cover Ratio is EBIT / Interest, where EBIT is Earnings before Interest and Tax. What this ratio indicates is how easily the business can cover the interest payments for any debt they are carrying. Interest Cover less than 1 would indicate that the business in not generating enough earnings to meet their debt repayment obligations. Investors generally consider a ratio of less than 1.5 as in the danger zone for a business. Best Practice Benchmarks for small business for the Interest Cover Ratio is greater than 10 times. This margin means that fluctuations in sales are unlikely to result in a call from the bank manager and a difficult conversation. It means that the business is not carrying too much debt for their earnings level. Earnings volatility and high debt levels are one of the major causes of business failure. While this measure is not often considered, it’s a strategically important benchmark of the strength of a business’ position in the marketplace. Value added as a percentage of sales is defined as the ratio of costs remaining after third party costs for services and materials to deliver the products that the business sells are removed as a percentage of sales. The higher this measure is, the more of the value is created and kept inhouse. So if a large amount of production and service delivery is outsourced, which would include paying third parties a licence fee for their intellectual property, this measure would be low and the less value is added by the business. This is often referred to the level of vertical integration. The lower this measure, the less there is that is unique to the business, and the easier it is to copy, and the less profitable and sustainable the business is likely to be. The best practice benchmark for value added as a percentage of sales is > 65%. Empower Business Solutions relies on its own internally researched and developed intellectual property and pays no licence fees to others to develop it on its behalf. How productive should each employee in your business be? One simple way of calculating this measure would be dividing Total Sales by the number of Full Time Equivalent employees. However this varies considerably by industry, the skill level of the average employee and the capital investment in the business. For example, the income generated per employee by an engineering design consultancy is going to be very much higher than for a bakery business. Similarly the return per employee will be higher for highly automated industries compared with home builders due to the capital intensity of the business. So benchmarking best practice for Total Sales per employee needs to be undertaken industry by industry. One of the best tools I have seen for doing this has been provided by the Australian Tax Office, for different reasons of course. They have developed a range of benchmarks by sector, for the purpose of targeting for tax audits for those outside their ranges, but the high points of their range can be used as an indicator of best practice. To calculate the benchmark, rather than dividing by the number of employees, I suggest dividing by the labour costs. For example, in a carpentry business with greater than $400,000 turnover, the lowest percentage labour cost is 23%. The best practice ratio then for Total Sales per employee is 4.2. There are many different sectors that are listed in this survey, but just one word of warning as you use it for yours, the ATO excludes the owners’ labour costs from the labour cost calculation, so adjust yours to the same basis for an apples to apples comparison. Many businesses go bust while making a profit. Cash is King, which is why your debtor position is so important. A business may look at its balance sheet and see an apparently healthy Current Asset Ratio (Current Assets / Current Liabilities) but this measure can hide bad debts. The debtor position can reveal much more about your liquidity. The older the debt, the less likely it is to be paid. This gives an indication of how long it takes you on average to be paid. Clearly the shorter the time, the better so that suppliers and staff can also be paid in a timely fashion. Best Practice Benchmark Performance for Debtors is less than 35 days. The Creditors measure refers to the average number of days it takes to make a payment by a business. While there is a temptation to delay payment for as long as possible to maximise working capital and assist cashflow, especially if a business’ Debtors are slow in paying; but this is not what the best small businesses do. When you delay payment of your invoices, your creditors consider your business unreliable, and may decline to extend credit or provide you preferential treatment. Ultimately, they may decide not to do business with you at all. With the omnipresence of social media, it doesn’t take long for this reputation to become widespread, eventually making it’s way to a business’ customers. Small business best practice is that creditors are paid within 35 days. As a result, such businesses are likely to receive favourable terms from their suppliers, and be regarded as a reliable business partner in the marketplace. In business Cash is King. Many business go broke ‘making a profit’. Cash at Bank refers to the ‘liquid’ assets that are actually cash or can be turned into cash very quickly. Having a minimum level of Cash at Bank is essential to ensure continuity of operations. Liquid assets explicitly excludes inventory which may take some time to turn into cash. Cash at Bank is expressed as a percentage of sales. The small business best practice benchmark for Cash at Bank is > 4%. This covers about two weeks of sales and provides some cover for payment delays from customers so that short term payments to staff and creditors can be made. On the other hand, too high a level of Cash at Bank may indicate lazy assets with cash better deployed elsewhere to increase returns. In ancient times, a merchant would test for the purity of a gold item being traded with acid. Pure gold wasn’t affected by acid, but if the item was made with a low cost metal alloy, the acid would react. In business, the Acid Test refers to a business’ solvency in the event there was a shortfall in sales or delayed payment from debtors. This is the ability to operate at very short notice if there was a loss of income for any reason. It is the most stringent test of a business’ ability to cover short term obligations. Inventories are excluded as often it is difficult to turn them into cash. This ratio lets the business and its creditors, if the owners are seeking finance, know how much of their short term debt can be met by selling the business’ liquid assets at very short notice. It is an indication that the business has the resources to operate for short periods without further cash inflow. If the ratio is too low, small disruptions could make the business insolvent. Too high a ratio on the other hand, would indicate there are lazy assets in the business. Best practice is for the Acid Test ratio is that Current Assets are greater than 1.5 times Current Liabilities.